ACCEPTED OFFER. 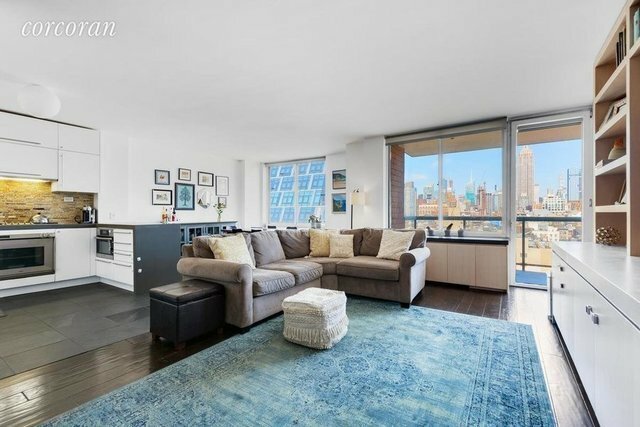 This beautifully and fully renovated high floor 2 bed, 2 bath home boasts spectacular city and Empire State Building views, tons of natural light and a private balcony. The living room has been thoughtfully designed with a wall of custom cabinets with bookshelves and a concealed desk, wall mounted tv, dark wood floors and access to the balcony. The kitchen was redesigned to open to the living / dining area and has an abundance of storage with modern white cabinetry, classic deep gray stone floors and gray caesarstone countertop. Top of the line appliances include a stainless steel Sub-Zero fridge with two bottom drawer freezers, Miele DW, Miele built-in microwave, Gaggenau cooktop and oven. The second bath is white on white with mod round tiles, a deep soaking tub and luxury fixtures. The ensuite master bath is large with a separate shower and a deep soaking tub. Both bedrooms are spacious with hardwood floors, built-in cabinets below the windows and custom closet organizers with drawers. There are additional hall closets plus a Miele washer and dryer in the apartment. The Grosvenor House is a boutique condominium building centrally located between 5th and 6th Avenues just minutes to Union Square, the Farmer's Market, Whole Foods and most major subways lines. The building has a 24 hour doorman, live-in super, gym, storage, bike room and a spectacular roof deck. Sorry, the building does not allow pets for renters. 24 Hour notice for all showings.